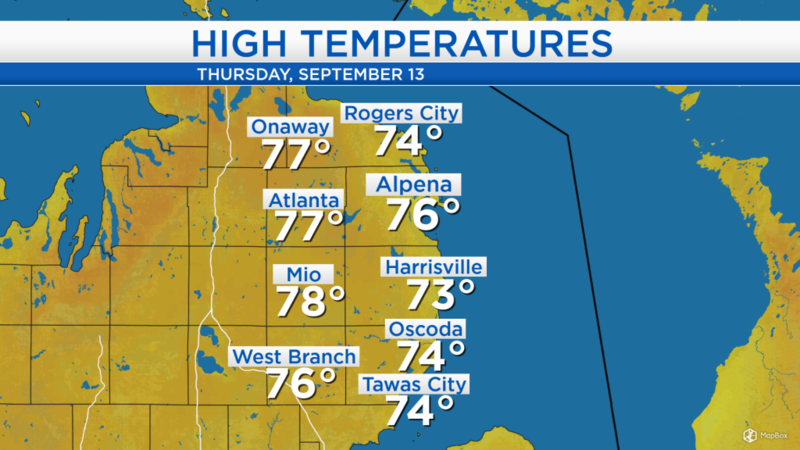 High temperatures today reached the upper 70s under partly cloudy skies. Though, temperatures were a few degrees cooler at the shoreline because of a breeze off of Lake Huron at 5-10 mph. Hurricane Florence is moving toward the North Carolina-South Carolina border, likely making landfall tomorrow afternoon. Much of the North Carolina coast and a section of South Carolina will receive rainfall amounts over 10 inches between now and Saturday. Wind speeds will exceed 70 mph at some coastal locations for several hours tonight and tomorrow. 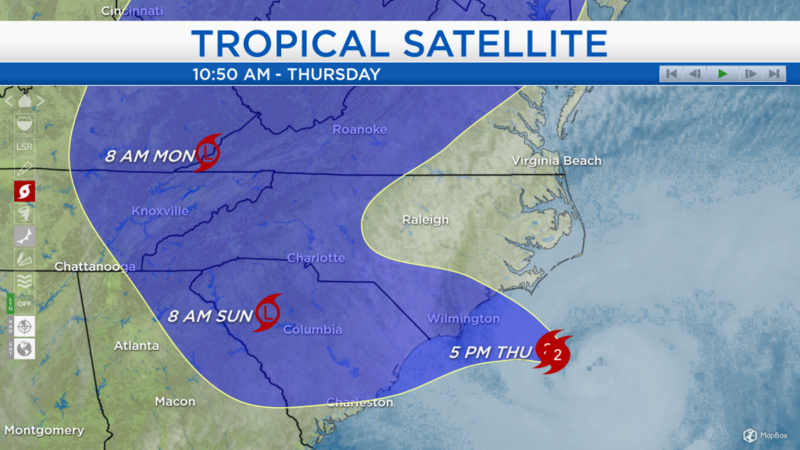 The tropical storm force (stronger than 39 mph) and hurricane force (stronger than 74 mph) winds will affect a wide swath of North Carolina through tomorrow night. The bigger issue will be rainfall of 10-30 inches and storm surge — the water of the ocean is forecast to rise more than 10 feet above normal levels and get pushed inland. Around here, low temperatures tonight will drop to the mid-50s, gradually rise to the lower 60s in the morning, then warm to a high near 80 degrees in the afternoon. Dry weather and partly cloudy skies are expected tomorrow. A repeat of tomorrow’s weather is forecast for Saturday, partly cloudy skies and high temperatures close to 80 degrees. Slightly warmer temperatures and a little more sunshine are in store on Sunday. After that, there is a chance for some rain in the early part of next week — for the rest of Northeast Michigan’s weather forecast, watch the latest weather video by clicking the weather tab at the top of the page.